Did you know 82% of smartphone users do research on their phones before making a purchase? This means that if those consumers are not finding your company you’re missing out on business. Digital marketing is taking the advertising world by storm and for great reason. Keep reading to learn ten undeniable benefits of digital marketing in today’s economy. Although every company has their own specific goals they all have one thing in common they want to reach more people. One of the best ways to do this in today’s world is through digital marketing. There are plenty of benefits of digital marketing which can’t be denied and when applied will help a business grow. Traditional marketing was expensive because it required running ads on newspapers, televisions, billboards, and radio stations which all added up. Digital marketing is taking the traditional ways of advertising and putting them online. Thanks to digital marketing small businesses can afford to get more for their money. No more competing for ad space for the small business owner. Digital marketing can be very powerful when you know what you’re doing. You have the power to reach people you would’ve never reached before thanks to the worldwide web. In turn, your business will increase sales and conversions. Digital marketing allows you to reach people that are on their phones. This is a huge deal because in the United States alone 77% of adults own a smartphone. You can reach all of these smartphone users by learning where your target audience spends most of their time and you can make sure you’re there in their face for them to learn about your company. This has been a game changer for companies because they can interact directly with those interested in their products. Having questions answered through messenger or DM gives the customer a more personal experience. You can also interact with your target audience through comments on posts. Being present will make you trustworthy to your audience and they will feel part of your brand and your community. This, in turn, will make them loyal to what your business offers. You have the opportunity to build a strong brand reputation thanks to digital marketing. When you give what you say you’re going to give or exceed a clients expectation they will be sure to refer their friends and family. This can work both ways so make sure that you don’t ruin your brand reputation by not delivering what you said you would. People are quick to tell others about their terrible experience or the product they didn’t receive. A huge benefit that digital marketing offers is the ability to track results. Tracking mailers, ads, and billboards weren’t as easy with traditional marketing. With technology, a business is able to monitor the exact ads and type of content people looked at before making a purchase. Knowing this type of information tells you the type of marketing methods that are effective and working. This gives you an upper hand to improve your strategy to something you know is working. It will also save you money by not continuing something that isn’t working before you keep spending. Traditional marketing involved getting in front of anyone and everyone. Digital marketing means targeting ideal buyers or customers. Instead of randomly showing people what you have that have no interest in what you offer you can target to show what you have to those that are interested. You can make sure that the right people are seeing what you have. There are different ways of targeting your audience and they have all proven to be great for business growth. Most customers are on social media hanging out throughout the day from the moment they wake up to the moment they go to sleep. No matter the product or service you offer your buyers are more than likely spending time on more than one social media platform. The ability to reach these engaged social media consumers can bring your business a new influx of excited customers. Social media influencers have grown in the past years. This is where influencers are spending their time sharing with their fans and followers what they like and don’t like. With digital marketing, you have the opportunity to build a relationship and eventually have an influencer related to your niche endorse your company. This will bring awareness to your brand and will drive their fans to see who your company is and possibly become your customer because they trust what the influencer they follow says or recommends. Small businesses are no longer intimidated by large named companies. Long gone are the days that limited resources give small businesses little chance to compete with their larger competitors. Traditional marketing requires a large budget to be effective. Digital marketing is more affordable and allows any business no matter its size to gain online exposure. Ready to Take Advantage of Digital Marketing? 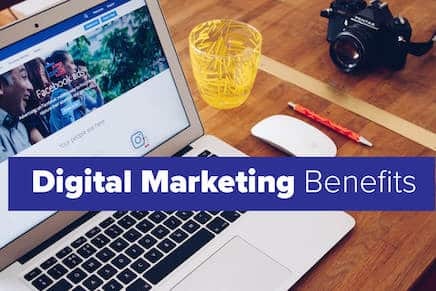 After going over the list above there’s no doubt that there are many benefits of digital marketing. Digital marketing has become one of the most cost-effective ways to reach more potential customers for a business. Taking advantage of technology and today’s resources you will be in front of thousands and millions of potential consumers in no time. Are you ready to elevate your business with professionals taking care of your digital marketing needs? Contact us today so that we can discuss your needs.